FLORIDA 40 • SHOPPING CENTER BUSINESS • August 2018 land-based Publix is reigniting its GreenWise store concept. Created by Publix in 2003, GreenWise is a line of USDA-certified organic products including food and cleaning items. Publix is expanding the line to include smaller-scale concept stores. The first newly redesigned Green- Wise Market is expected to open in Tallahassee in September, and a sec- ond will launch in Lakeland in 2019. The stores' footprints average 25,000 square feet, whereas an average Publix store is 44,000 square feet. Southeastern Grocers, parent com- pany of Winn-Dixie, is continuing its expansion in Florida with its new His- panic-focused banner, Fresco y Más. The chain has been met with wide success in South Florida, where it has 22 locations since its first opening in 2016. "Fresco y Más has a number of loca- tions in Miami, but is expanding into other markets of Florida as well, spe- cifically Tampa and Orlando," says Dottore. "That could be something that really helps Winn-Dixie find its footing." FINDING NEW USES Like other metros throughout the Southeast, shuttered big boxes are creating opportunities for new retail- ers to move in and the vacant spaces are being absorbed at a rapid pace. Miami-Dade County posted 164,617 square feet of positive absorption in the first quarter, according to CoStar, and Orlando and Tampa/St. Peters- burg posted positive net absorption of 237,927 and 102,479 square feet, respectively. "In South Florida, the big boxes are leasing quickly," says Katy Welsh, se- nior vice president of retail services at Colliers International South Florida. "South Florida has a robust tourist, business and retired population with dollars to spend in retail centers." In June, Ashley Furniture won the bid to take over the former Toys 'R' Us store located near The Mall at Mille- nia in Orlando. And in South Florida, Weingarten Realty Investors is work- ing to redevelop a vacant Toys 'R' Us at Kendall's Palms at Town and Country Mall. "When all of those big boxes be- came available, there was a queue of people waiting to snag them up," says Gallaher of NAI Miami. "Generally speaking, they are great pieces of dirt for redevelopment where open sites are scarce." Earlier this year, Sears closed its 180,029-square-foot store at Town Center at Boca Raton. Simon Prop- erty Group owns most of the mall, but Seritage Growth Properties owns the Sears building and its 18.6-acre site. The New York-based REIT will replace the store with 150,000 square feet of retail. 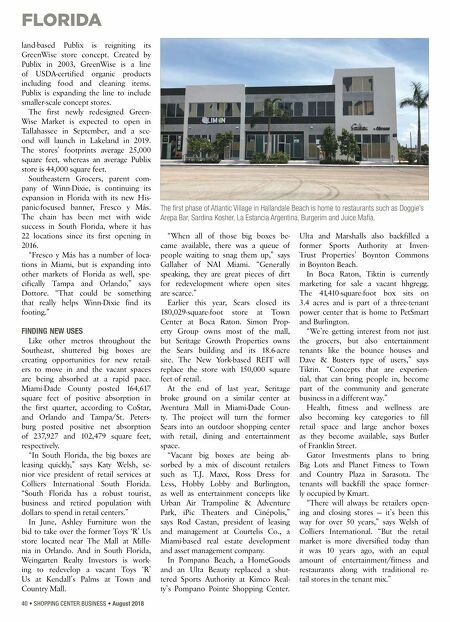 At the end of last year, Seritage broke ground on a similar center at Aventura Mall in Miami-Dade Coun- ty. The project will turn the former Sears into an outdoor shopping center with retail, dining and entertainment space. 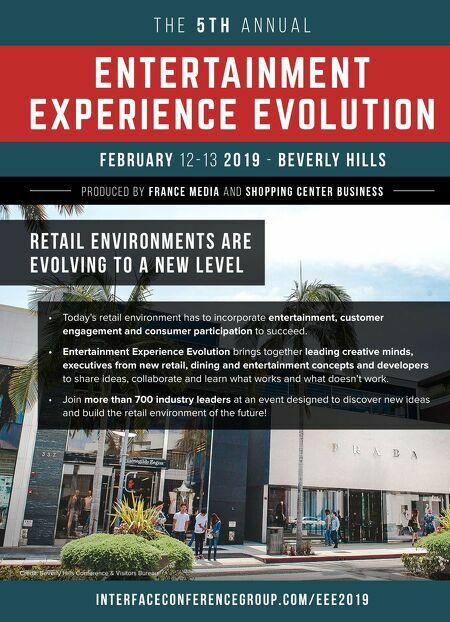 "Vacant big boxes are being ab- sorbed by a mix of discount retailers such as T.J. Maxx, Ross Dress for Less, Hobby Lobby and Burlington, as well as entertainment concepts like Urban Air Trampoline & Adventure Park, iPic Theaters and Cinépolis," says Rod Castan, president of leasing and management at Courtelis Co., a Miami-based real estate development and asset management company. In Pompano Beach, a HomeGoods and an Ulta Beauty replaced a shut- tered Sports Authority at Kimco Real- ty's Pompano Pointe Shopping Center. Ulta and Marshalls also backfilled a former Sports Authority at Inven- Trust Properties' Boynton Commons in Boynton Beach. In Boca Raton, Tiktin is currently marketing for sale a vacant hhgregg. The 41,410-square-foot box sits on 3.4 acres and is part of a three-tenant power center that is home to PetSmart and Burlington. "We're getting interest from not just the grocers, but also entertainment tenants like the bounce houses and Dave & Busters type of users," says Tiktin. "Concepts that are experien- tial, that can bring people in, become part of the community and generate business in a different way." Health, fitness and wellness are also becoming key categories to fill retail space and large anchor boxes as they become available, says Butler of Franklin Street. Gator Investments plans to bring Big Lots and Planet Fitness to Town and Country Plaza in Sarasota. The tenants will backfill the space former- ly occupied by Kmart. "There will always be retailers open- ing and closing stores — it's been this way for over 50 years," says Welsh of Colliers International. "But the retail market is more diversified today than it was 10 years ago, with an equal amount of entertainment/fitness and restaurants along with traditional re- tail stores in the tenant mix." The first phase of Atlantic Village in Hallandale Beach is home to restaurants such as Doggie's Arepa Bar, Sardina Kosher, La Estancia Argentina, Burgerim and Juice Mafia.